Karnataka is not a homogeneous state as evidenced by its diversity. Kannada spoken in different regions of the state has been 'colloquialized ', to such an extent that in many instances it is incomprehensible to one well versed in classical Kannada. Even more surprising is the presence of two districts in Karnataka that speak entirely different languages, which makes one wonder how they were classified under the linguistic state of Karnataka. These two regions are Tulu Nadu and Kodagu. Though Kannada is the official language, the spoken languages here differ a great deal from it. When the history of Tulu Nadu is studied, the reasons for it to be included in Karnataka become apparent. 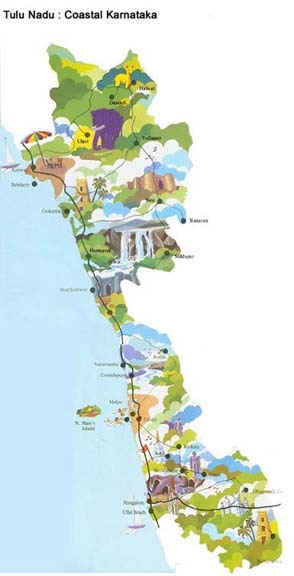 The areas currently known as Dakshina Kannada and the coastal part of the adjacent district Uttara Kannada up to Gokarna are the historical Tulu Nadu. Many centuries ago the center of Tulu culture was probably in the Uttara Kannada (Honnavara), and Udupi as well as Mangalore were at the periphery. Today, however, Tulu is spoken only in the region below River Kalyanpur. The people living north of the river now speak Kannada. The reason for this is not clear in history. The region, although it maintained some form of independence, was always under the suzerainty of various rulers and dynasties that controlled Karnataka. Tulu Nadu was originally called Alvakheda (a second century C.E. reference from Greece calls it Olokhoira). Many historians agree that this is the region Emperor Ashoka referred to in his edicts as Satiyaputra, one of the four regions outside of his empire (the other three being Chola, Chera and Pandya kingdoms). 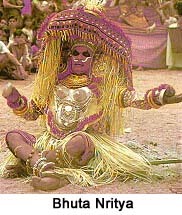 The longest reigning dynasty of Tulu Nadu was the Alupas (Aluvas). Switching between Mangaluru and Udyavar, Barakuru and back to Mangaluru as their political centers, Alupas have the distinction of a continuous dynasty for more than one thousand years. They were the feudatories of the prominent dynasties of Karnataka. Kadamba dynasty of Banavasi was the earliest, under which the Alupas flourished. Later the Rashtrakutas of Manyakheta, Chalukyas of Badami, Chalukyas of Kalyani, Hoysalas of Durasamudra and Rayas of Vijayanagara were the overlords. Alupas, however, were independent and their subordination was nominal at best. They ruled until the Vijayanagara kings totally dominated the Tulu Nadu from 14th to the 17th centuries. The region became extremely prosperous during Vijayanagara period with Barakuru and Mangaluru gaining importance. After the decline of Vijayanagara Empire, the Nayaks of Keladi (Ikkeri), who controlled much of Tulu Nadu, let it decline and internal skirmishes eventually led to it being controlled, at the end of 18th century, by the Sultans of Mysore, namely Haider Ali and Tippu Sultan. Mangalore played a prominent role in Tippu's battles with the British. Tippu's French alliance also led to some French presence in Mangalore. The British gained full control in 1801, after the defeat of Tippu in 1799. The British ruled the region with Madras as its headquarters. When the Indian independence was achieved in 1947, Tulu Nadu became part of Madras state. When the states were divided into linguistic states in the 1950's, Tulu Nadu became part of Karnataka. Much of the land known as Tulu Nadu was under sea eons ago. There is fossil evidence to support this. This might even have led to the legend of coastal Karnataka as a creation of Parashurama. Lord Parashurama was said to have had a dispute with the lord of the seas, Varuna. In a rage he threw his axe and claimed the coastal region from the sea, part of which is Tulu Nadu. Hence the region is referred to as 'Parashurama Srishti.' Visits to seven well-known temples of Parashurama kshetra (Tulu Nadu) will bring countless blessings to the devotees. The seven temples all nestled in the coastal Karnataka are in Udupi, Kolluru, Subramanya, Gokarna, Kumbasi, Koteshvara and Shankaranarayana. They are collectively called mukti sthalas. Proof of earliest human habitation is from about 10,000 years ago. Before the Kadambas of Banavasi invited Brahmins in the 5th century to settle in the region, the people were mainly spirit-worshippers (bhuta-aradhana). Brahmins brought Vedic culture to Tulu Nadu. In the 8th century Shankaracharya had a profound effect on the theology and philosophy of the educated class. He had visited Subramanya and Kolluru, where he won over many theologians in discursive debates. Advaita philosophy of Shankaracharya became popular. Over the following many centuries, more ethnic groups migrated to the area. Konkanas from Maharashtra and many of their sub-sects moved to Tulu Nadu, mainly seeking business opportunities. Konkanas and Gouda Sarasvats were said to have come by sea, as Mangalore was a major port that was serving not only the Portuguese but also the Arabs for maritime trades. Jains were already a prominent group and even today are uniquely preserved in Tulu Nadu. Their prominence declined not only after the Hoysala king, Vishnuvardhana converted to Hinduism ' with the influence of Ramanujacharya in Melukote ' but also because of targeted decimation of their population by the Muslim rulers in the North. The strong influence Madhvacharya had in the region also played an important role in decline of other religions. However, Jain community thrived in smaller numbers, in the relative safety of Tulu Nadu. The ancient Jains have left behind indelible reminders of their glory with temples-bastis- (Mudabidri) and monolithic statues of Bahubali, the gomateshwara in Karkala, Venoor and now in Dharmasthala. The Alupas (or Aluvas-hence the term Alvakheda) who were ruling Tulu Nadu continuously for more than one thousand years have left few reminders of their existence except for some forts, which are in ruins. Their descendents are now in the Jain as well as non-Brahmin communities. 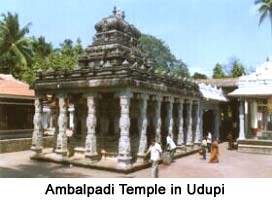 Madhvacharya in the 13th century built the eight monasteries (Matths) in Ududpi, which became the nucleus of Hindu theosophy. In the 16th century there was a large influx of Catholics to Tulu Nadu. They arrived from Goa, mainly as farmers and had a close association with the Portuguese. They quickly became successful landowners but suffered a setback under Haider Ali and Tippu Sultan in late 18th century. About 60,000 of them along with Portuguese Christians were interned in Srirangapatnam, when their loyalty was questioned and they were accused of colluding with the British. Only after Tippu's death in 1799 did the survivors return to Tulu Nadu, once again to become a prosperous community. A glorious church, inspired by the Sistine chapel of the Vatican, built in Mangalore (at St. Aloysius College campus) is a monument to the Catholic architecture. They also excelled at building educational institutes. The Muslim community of Tulu Nadu is also prominent. They have had close ties to the Muslims of Kerala and even speak a language that is a combination of Malayalam and Tulu. Their population increased during the rules of Bijapur sultans and the sultans of Mysore. They, along with the Konkanas have carved a niche in the business society of Tulu Nadu. All these communities live in harmony in Tulu Nadu today. This has given it a diverse culture and society. The Brahmins, Konkanas, non-Brahmin Hindus, Jains, Catholics and the Muslims play a pivotal role in the local economy. Having vastly different landscapes, from seashores to mountainous Western Ghats, with their rain forests, give the region a unique advantage. Farmers, landowners, businesspeople and professionals are to be found in all the communities. The once prevalent separation according to castes is no longer seen in Tulu Nadu. Bhuta-nritya or spirit-dance: This practice can be still seen played in villages and many bhutas are still worshipped (see later). Naga-mandala and Dakke-bali: An elaborate form of serpent worship, unique to Tulu Nadu. There is a distinct form of dance associated with it that is akin to yakshagana. It is performed only by a group of people who call themselves Vaidyas. Aliya-santana: The practice of inheritance passing to the nephew (maternal), instead of one's progeny. This along with 14 kattus and 16 kattales (laws governing the society), is seen in the non-Brahmin community. Similar to the gothras of Brahmin community, the ancestral lineage is traced through bali (Dravidian system). Tulu language, spoken nowhere else, serves as a bond between the people of different communities, giving them a sense of separation from the rest of South India. Tatva-vada of Sri Madhvacharya (birth place of Dvaita philosophy). If Christianity influenced Madhva philosophy, as proposed by some experts, the influence of Christianity in the region was long before the appearance of the Portuguese in the 16th century. To this may be added the extraordinary dance ritual of yakshagana, which is practiced in the form of bayalata, in open-air theaters. It is the rendition of stories of the Hindu mythology and Puranas in the form of dance-drama. The most popular theme for bayalata is the story of Koti'Channaye, which has deep-rooted mythical significance in Tulu Nadu. The origin of naga-mandala is still a mystery. It seems to be a remnant of some ancient tribal worship of the serpent god: naga. The naga-bandha is an art that is drawn at the time of the dance ritual. The dance is associated with the families of Vaidya and the origin of such families is also lost in obscurity. Naga-mandala ritual is practiced in only four districts in Dakshina Kannada, namely Udupi, Karkala, Puttur and Mangalore. One naga-patri (possessed one) and three or more Vaidyas dance around the naga-bandha for hours, to the music of drums (called dakke or damaruka) and cymbals, in a trance like manner. It is believed that the ritual will absolve the attendees of the curse of the serpent and protect them from leprosy. It also restores prosperity of progeny and begets children to barren couples. Bhuta-aradhana in Tulu Nadu is similar to the rest of South India though the bhutas as well as their worship differ. The kola or nema is the yearly ceremony celebrating the festival of bhutas. They have attained a godly status among some worshippers, mainly non-Brahmins, and even have their own bhuta-sthanas (a place of abode similar to temples). Bhutas can be animistic as in Panjurli (pig) or Pili-bhuta (tiger). However, in many villages the Brahmins, who consider these spirits as their protectorates, conduct the yearly ceremonies. A second variety can be representatives of characters taken out of the Puranas like Berme (Brahma), Lekkesiri (Raktesvari, Kali) or Vishnumurti etc. A third category is deified human beings like Gulige, Annappe, and Koti-Chananye etc. The fourth kind is strictly local characters like Male-Chandi (from the male-Nadu), Ullaldi (from Ullal), and Malaraye (from the Ghats). Then there are devils which provide comical relief during nemas, namely Marlu-Jumadi (crazy Jumadi) or Potte (dumb/deaf devil). Newer bhutas also have been added like Posa-bhuta (new devil), Vokku-Ballala, and Muttappe etc. The legend of aliya-santana (as against makkala-santana) is traced back to Bhutala-Pandya in year 77 C.E. Deva-Pandya launched his newly built fleet of ships into sea but ran afoul with the lord of demons, Kundodara. The demon asked the king to give him one of his sons as sacrifice, the king's wife refused. Satyavati, the king's sister offered her son, Jaya-Pandya instead. The demonic Kundodara was pleased by this act, honored the child and restored to him his father's kingdom of Jayantika. Later, the same drama was played out again and this time the king's wife not only refused to part with one of her sons but also publicly renounced her position as queen and her son's rights for any property. Kundodara then instructed Deva-Pandya to disinherit his children and make his sister's son (nephew) his legal heir. Jaya-Pandya was given the name Bhutala-Pandya and was seated on the throne, from where he ruled for 75 years. Thus was born the aliya-santana, where the nephew became the legal heir to property. From whence the practice of aliya-santana is prevalent in the region is not clear. The etymology of Tulu language is also not known as well the meaning of the term Tulu is a matter of conjecture. There are half a dozen variations of spoken Tulu. An original Tulu script was thought to have never existed but a script resembling Malayalam was used to write it. Brahmins seeking further knowledge in agama shastra went to Kerala and jotted down notes in a script that was thought to be heavily borrowed from Malayalam. This came to be known as Tulu script, which later became extinct due to disuse. However, the close resemblance to Malayalam may have created the impression that Tulu is not a legitimate language with its own script. More recent discovery of some Tulu literature (two poems and one prose) may yet prove that Tulu had its own script derived from Grantha script just like other Dravidian languages like Tamil and Malayalam. It is now strongly believed that the script of Malayalam (which evolved much later than Tulu) was derived from the original Tulu script and not the reverse. With their close association with Karnataka throughout its history, the Kannada language is the official language of governance and trade. More and more evidence has been gathered to suggest that Tulu is one of the oldest Dravidian languages (one of five) with its own script, and preceded many of the major languages of the South used today. Madhvacharya's tatva-vada or Vaishnava-siddhanta took shape in Udupi in the 13th century. Madhva was a child prodigy, who had mastered Sanskrit by age five and the Vedas by the age of ten. He lived for eighty years and said to have joined his guru, Badarayana in the Himalayas in the year 1317. He was a well-built personality, a tall and strong-limbed man, interested in varied subjects including music, sculpture, debating and weight lifting. He has written 40 books, mostly commentaries on Vedanta, and established a unique approach to Vedantic philosophy. He claimed to be the third incarnation of Vayu, the sublime angel of God. His tatva-vada is referred to as Dvaita philosophy (dual). He founded the Sri Krishna temple in Udupi and the eight monasteries for the ascetics around the temple. Udupi became the center of devotional Hinduism and even today is considered as the hub of Vaishnavism and Vedanta. Madhvacharya was undoubtedly the most famous and influential personality of Tulu Nadu. Over its history, Tulu Nadu has been the melting pot for outsiders. The immigration continues even in the modern era. Many Northerners like Gujaratis and Sindhis have settled in Mangalore and become successful businessmen. It is the largesse of the heart of Tuluva people that does not discriminate between the people of any ethnicity, caste or creed. This quality is deeply rooted in their history. As history establishes great language TULU is now slowly getting relegated to a dialect. It is only to be improved by TULUVAs. There is no need of any separate state for TULUNAD. The TULUVAs must speak TULU only at home instead of Kannada, Hindhi or other languages. The ancient TULU SCRIPT must be reorganised and improved to the levels of Kannada/Malayalam. Every school in the TULUVA districts must have 2 periods a week to impart/promote the knowledge of TULU among TULUVAS. The wedding cards , be in any script must be in TULU language. I am a non TULU and Non Kannada guy but loving both languages. Please once think why tuluvas using 50% kannada word.They forgetting original tulu words because of Kannadamaya.Be a tuluva and support for separate tulunad state.And im using 95% tuluwords why not you? We want Konkani which from Goa and Byaribhashe which is from Kerala but we do not want Kannada which is from our own State, Appreciable approach to devide the state. I am a tuluva and I respect my language, but I know for certain that no one can speak tulu language without using Kannada words, over 50% of the words in Tulu are loan words from Kannada. Such a hatredness towards Kannada is not good. Never try to fill the hearts of innocent tuluvas with poison of hatredness. No tuluva will support your view. It is purely fanatic approach to devide the State and ultimately the country. Try to make Sanskrit, which is the mother of all languages, our national language. 8) There are 5 dravidian languages one of them is tulu and rest all have own states. 10) Tulu and tulu Nadu culture will vanish if we do not have a seperate state. Tulu nadu has become kannada maya in the last 65 years. Tulu people do not speak in Tulu language official functions. 12) There are hardly any job opportunities in Tulu Nadu and hence people migrate to other places, there is more violance in Tulu Nadu and tulu Nadu people do not have their own identity. 14) If kannadigas argue that seperate statehood for tulu nadu is unacceptable, they only have to go back to their history ask themselves why they seperated from tamil Nadu. Brahui language of Afghanisthan is having resemblense with tulu.try to link any remote connection.